This weekend I spoke with Class A Lakewood manager Greg Legg about several of his players. 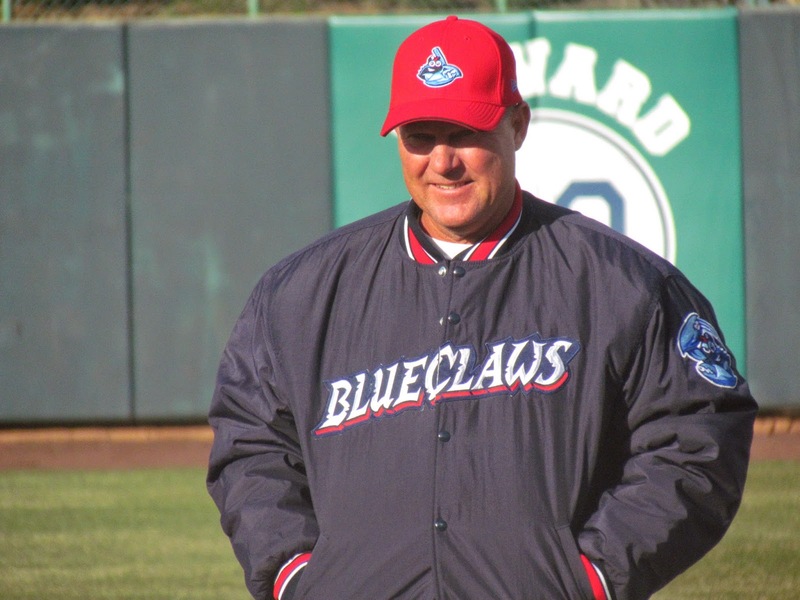 I also got insight from BlueClaws hitting coach Lino Connell on the Phillies' supplementary round (39th overall) draft choice from 2011 Larry Greene Jr.'s progress this year and the team's best hitter thus far, Willians Astudillo. Additionally, righty pitching prospect Tyler Viza spoke on how he stays focused and more. Read ahead for all those quotes. "Well, this would be a good year for him to do it. Kinda expect it. Right now, he hurt his wrist, so his wrist has been bothering him. He hurt it on a diving play out in the outfield. So, he's a little banged up right now. He's shown some signs of all that earlier in the season. The numbers aren't there yet. He got off to a pretty good start. He's hit a couple balls good and they haven't found holes. But, this wuld be a good year to do it. I hope his wrist's okay." "We got good news. He's not hurt as bad as we thought. He went and saw a doctor. He's okay. We're making sure...it's early in the season. We think a lot of Zach Green. We're making sure he's okay. We're protecting him a little bit. He would try to play. We're trying to get him 100-percent." "Well he's hit a lot of balls hard that haven't shown up in the box score as hits. Especially the last few games. he's been smoking some balls right at people. And he hit a homer the other day. He had another (one) well hit that the guy's played up against the fence (Thursday) night. So, I look for him to kind of keep doing what he's been doing and the ball's he's hit will find some holes and that average will go up." "He has competed well, throws strikes, pitches inside, gives our team a chance to win every outing he's been out there." "I think we expected (what he has done). The guys that know him and the people that evaluate him, Carlos Arroyo, Les (Lancaster), they knew what he was going to do. They knew he was going to throw strikes and compete and not back away from the competition of this level." "He's done his job. A left-handed reliever for us and he's done great job and, hopefully, he can get a couple more saves." "He's got a couple games where he got good contact (without results). He's shown a lot better approach at the plate and I think it's still a very short time to see what he's going to do on the year. But, we will keep working with him. He's right there. He's almost right where we want it. We got a lot of improvement in spring training. We see a lot of good things from him in spring training and, hopefully, this year we'll get where we want it." "We know that he's- the organization knows that he's one of our good hitters that we have. He always puts the ball in play. He always makes contact. He knows what he's doing at the plate, so it's no surprise for us to see what we see right now. He's always been like that. He's very mature at the plate to be able to do what he's doing right now." "I always try not to look back on what I did wrong. You know, I'm always looking forward to my next start once the start's over. I gotta focus one game at a time, one pitch at a time. Once the last pitch is over or the last game is over, you can't worry too much about it. I just try to keep a level head, a good mindset and move on." "The coaches have a lot of confidence in me and everybody else on the team. We have a great group of guys here and we have a great coaching staff. They know what they're talking about and believe that what they're saying, that we can all take in and I feel like I've been doing that as well as a lot of other people and we just take it one step at a time." "I feel very confident and comfortable. You know, I'm gonna keep coming at everybody, so I'm ready.